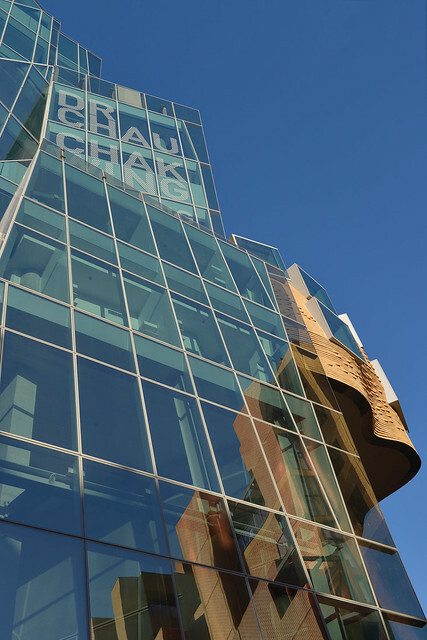 Although the twelve-storey Dr Chau Chak Wing Building at the University of Technology, Sydney presents as glass when looking towards the city, the overwhelming focus of public and media attention has been on the brickwork which dramatically marks the Ultimo Road and Goods Line elevations. The curvilinear design of the brick facade of the has been popularly dubbed a “crumpled paper bag” or even a “melting chocolate castle”.The public is obviously intrigued by the use of this familiar building material in a way that defies description as well as gravity. Despite the focus on the facade, this will be a highly functional building, as you would expect in a Business School. The “tree of knowledge” theme informs the internal design which will encourage collaborative learning and the breaking down of hierarchies. “We wanted an ethos of light, spacious site lines, both horizontally and vertically, all very organic,” Roy Green, the school’s dean, told The Australian. Bowral Bricks, a division of Brickworks Building Products, played a pivotal role in designing and manufacturing special bricks for this project, and helping develop bricklaying techniques that have transferred Frank Gehry’s vision from a jotting on a restaurant tablemat to reality. Don Bradman had just left Bowral Public School and was playing for the local team when Bowral Bricks opened its first kiln in 1922. Brickworks Ltd acquired the company in 2001 and after a large capital injection, the plant began making premium-quality dry-pressed bricks for the architectural market. It was their quality and the company’s wide experience at making special shape bricks, that made this relatively small “boutique” brick plant the ideal choice to develop and manufacture the five special brick types required for the UTS project. Their manufacture was the final stage in a development process that took over three years and spanned multiple continents. It resulted in a new method of constructing brickwork, a method that had never been used before anywhere or at anytime, while maintaining the craft and skill of bricklaying. But first, why was this innovation necessary? Surely a brick is a brick is a brick? Not when it is part of the vision of Frank Gehry, an architect whose work is famed for its unconventional use of materials and shapes. “I don’t think Frank Gehry actually owns a 90 degree set square!”mused Brian Moore, the UTS executive project manager on ABC radio. Gehry’s design required brickwork that curves in three dimensions, not only horizontally but also vertically.There lies the problem. Conventional brickwork is constructed by laying one brick on top of another, joined by mortar. But by the time the bricklayer has laid the tenth course, the mortar on the lower courses has hardened to the point where it will support the weight above without sagging or collapsing. Substantial areas of brickwork in the Dr Chau Chak Wing Building are not vertical, but actually progressively sloping outwards toward or away from the bricklayer at about 26 degrees from the vertical. This is called corbelling, but it is normally confined to use in arches or as a decorative single course of brickwork. In the UTS building, unless the brickwork is somehow restrained the force of gravity would cause it to collapse before the mortar had set. 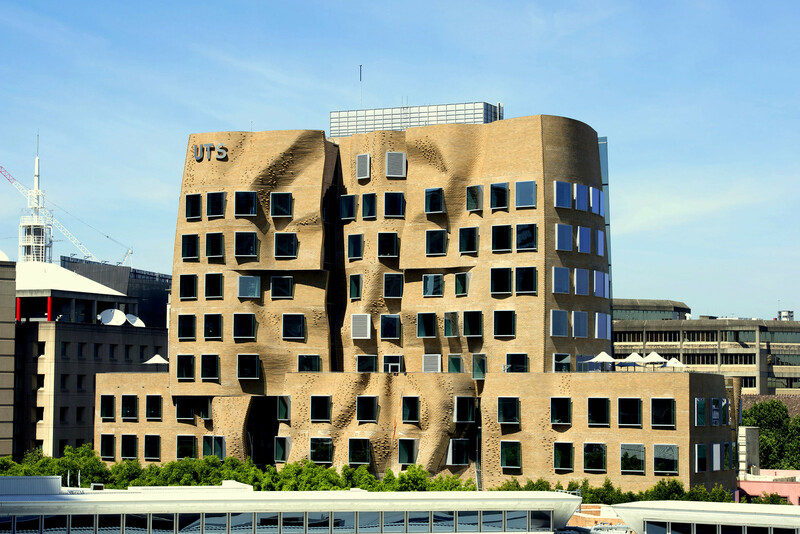 “The brick engineering was quite a complicated feature of the building, perhaps one of the most complicated in the history of bricks,” says Ken Morkaya, head of AECOM’s Building Engineering Group, commissioned directly by UTS to develop the brickwork system. 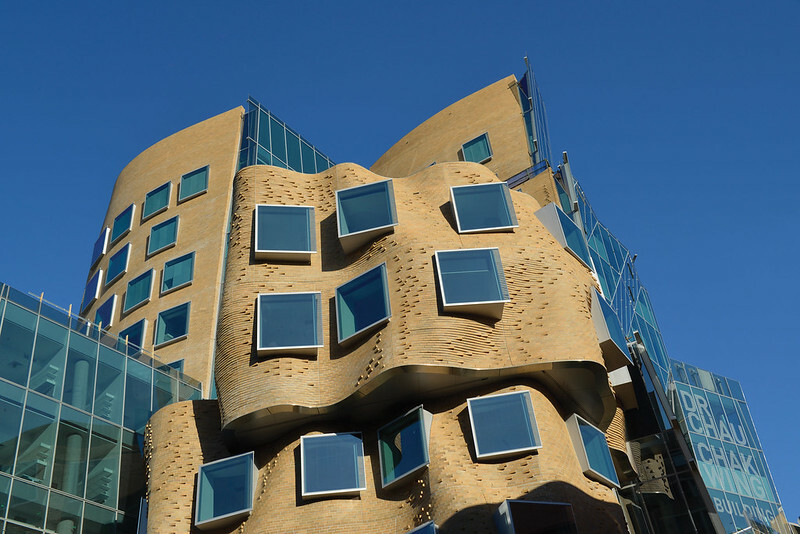 Like all brick walling, whether veneer or double brick, a cavity separates the inner and outer walls of the Gehry building to allow any moisture that may penetrate the wall to drain to the outside. The inner skin is prefabricated from steel and defines the meandering curves of the walling design.The outer face of the steel is coated with a waterprooofing membrane. Conventional brickwork uses wall ties that sit in the mortar bed and are fixed to either the timber frame or, in the case of double brick walling, to the inner skin of bricks. Once the mortar hardens, the tie is locked into place. The essential difference in this design – and this is the key engineering development that gives integrity to the brickwork – is that the tie is locked into a channel in the brick. Each tie is then connected back to the inner steel structure, located in a small carrier. The position of each carrier was precisely calculated by the designers and they were attached to the steel inner skin during fabrication. The ties are adjustable to allow for variations in the cavity width. Additionally, a heavy-gauge stainless steel wire is located in the channel, running the length of the section of brickwork. It too is locked into place by the adjustable nuts on each tie. Finally, a special mortar was developed for the project by AECOM’s Advanced Materials division. It may seem logical to use something like a fast-setting glue but this is almost impossible for the bricklayer to work with. The solution was to tweak a conventional mortar recipe to combine increased strength with workability. Each stage of the development of the technology was rigorously tested, both at a facility in Guangzhou, China and in Australia, including at UTS facilities. The complexity of the brickwork required Bowral Bricks to develop five special bricks, unique to this project and never made elsewhere at any time. The 380,000 bricks required for the project were manufactured at Bowral over four weeks in mid-2013.That may seem a lot of bricks but the plant produces about half a million units every week so this special run was readily accommodated. Gehry wanted a colour that echoed that of Sydney sandstone. Surprisingly, the colour chosen for this project is a popular standard in the Bowral range, Limousin Gold. DJRD’s Daniel Beekwilder concludes that “Frank Gehry has a long history of using different materials in a different way. 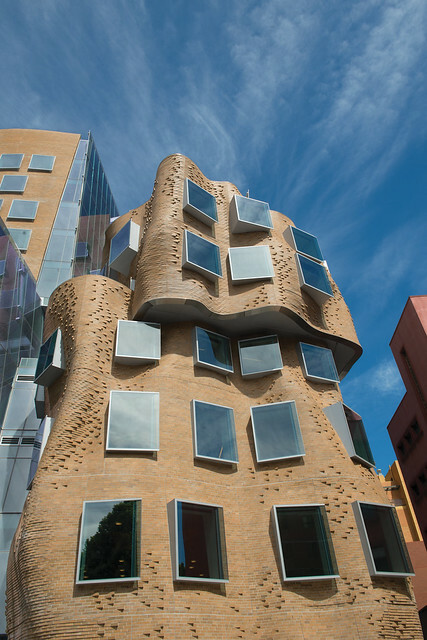 The use of brickwork as a plastic facade material is an amazing idea and Gehry Partners has demonstrated how brick can be used in an unconventional way to create a facade that appears to have a lot of movement. The crisp edges and deep, earthy colours of Bowral dry-pressed bricks blend style and function to present a clean, modern aesthetic.